Boy oh boy do I have a treat for you! Since moving to the Bay Area, I have been really impressed with the food scene, especially the Japanese food scene. When I was living on the east coast, it was always a bit challenging to find a really great Japanese restaurant. There’s just not a large Japanese population out there and in that respect, I always felt like I was missing out on a part of my cultural background to some degree. San Francisco (California in general) on the other hand, has a substantial Japanese population and consequently great Japanese restaurants out the wazoo! That being said, there are also plenty of mediocre to bad ones out there too. This dish was born out of the latter experience. One Sunday afternoon, Mr. HapaNom and I were out having a late lunch at a local sushi joint. The sushi was a meh – not bad, but not great either. The chicken teriyaki on the other hand, left a lot to be desired. 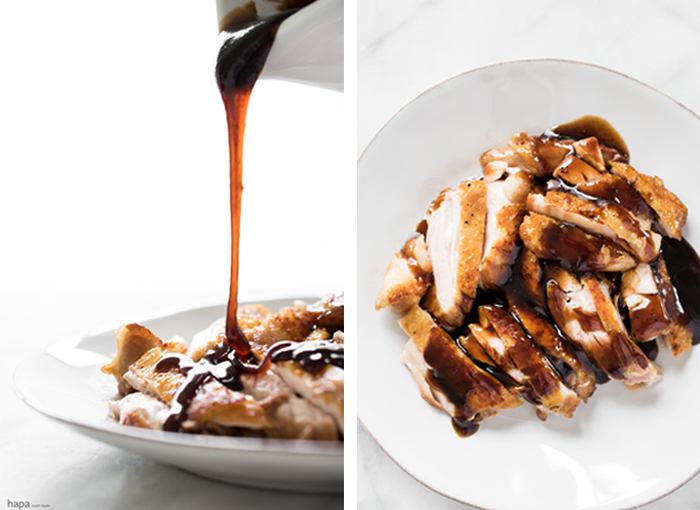 I don’t know what it is about chicken teriyaki – it’s such a simple dish to prepare, but so often I’m served bland, overcooked strips of chicken in a thin teriyaki sauce. The madness must stop! So I thought I would create a post with the way I like to prepare the dish… with a few twists. Rather than marinating the chicken, I find it’s more efficient and flavorful to create a rich, thick glaze to go over the cooked chicken. 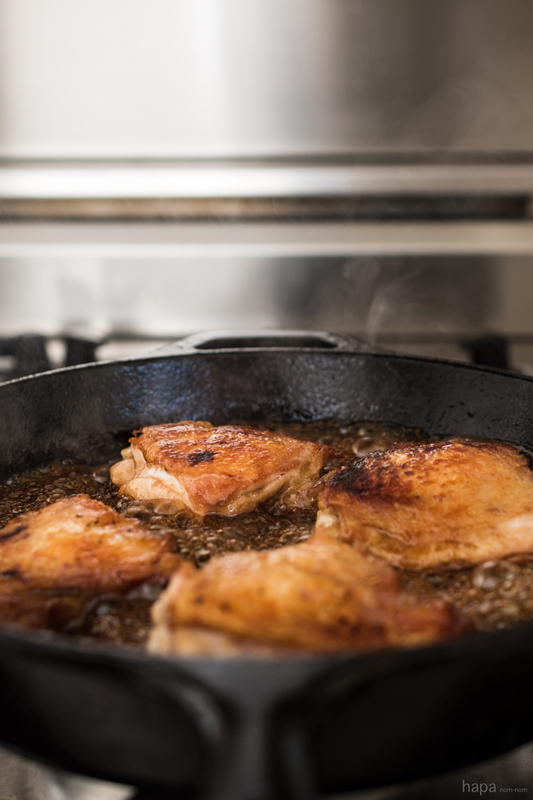 Likewise, I like to pan fry the chicken – creating incredibly crispy skin and tender, juicy meat inside. And the best part is, the chicken and the sauce is made all in the same pan! How easy is that?! So let’s talk a little bit about the cucumber salad. It’s the perfect tangy compliment to the rich and savory chicken teriyaki. This particular Japanese Cucumber Salad is a recipe adapted from my grandmother and a dish that I’ve enjoyed eating since I was a kid. Cucumbers are mostly made up of water, which we’ll want to remove by salting. When we salt vegetables, we’re drawing out the moisture through the process of osmosis. We do this for several reasons; we want to remove the excess moisture so it does not dilute the sauce or dressing, causing the veggies to swim in a pool of flavorless liquid. Likewise, it changes the texture of the vegetable – making it more pliable and less crisp. Vertically score the sides of the cucumber with a fork (you don't have to do this, but this is how my grandma prepared them). Then very thinly slice and transfer the slices to a colander in the sink. Sprinkle with salt, tossing the cucumber slices to coat (this will draw out the moisture). Allow to sit for 20 minutes. Combine all of the ingredients for the teriyaki sauce in a small bowl and set aside. To make the chicken, pat the thighs dry with a clean paper towel. Prick the skin all over with a fork. Warm the vegetable oil in a large heavy-bottomed skillet over medium-high heat. When the oil is hot, but not smoking, place the chicken skin side down into the pan. Cook until the fat has rendered and the skin is golden-brown, about 12 minutes. Flip the chicken and cook 7 minutes. Add the teriyaki sauce and bring the temperature down to medium. Cook for 2 minutes, allowing the sauce to thicken and then turn off the heat. Remove the chicken, cover, and allow to rest for 5 minutes. Slice the chicken into strips (I found that if you cut them skin side down, the skin stays on the chicken better). Pour the teriyaki sauce over the chicken and toss to coat. In large, dry skillet over medium-high heat, toast the tortillas one at a time until crisp and slightly charred around the edges, about 1 to 2 minutes per side. Wrap in a tea towel to keep warm. While the tortillas are toasting, combine the sour cream and Sriracha in a small bowl. 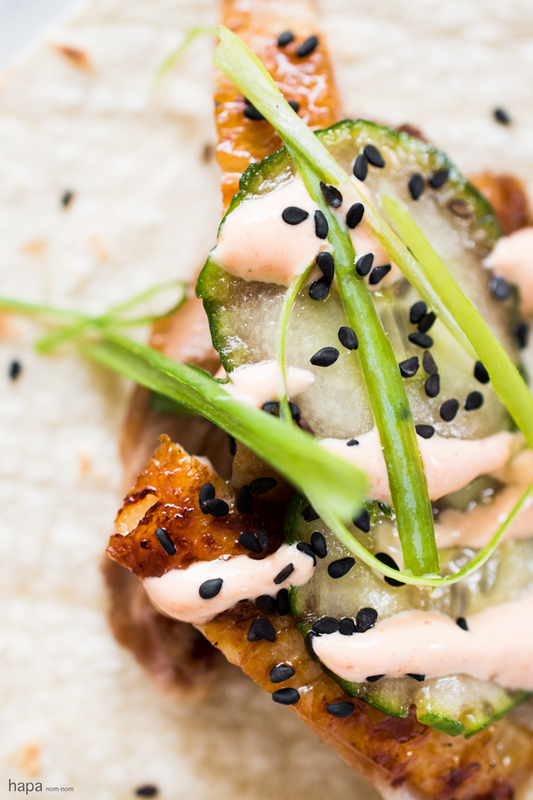 To assemble the tacos, layer few slices of teriyaki chicken, drizzle the Sriracha-sour cream on top, add some of the cucumber salad using a slotted spoon, scallions, and sprinkle some black sesame seeds. Serve and enjoy! *You can prepare the Japanese Cucumber Salad the night before for faster prep. **If you can't find Japanese or Persian cucumbers, you can substitute 1 large English cucumber. It will need to be seeded and cut into half-moons. I made these tonight. AMAZING! They will get made again. Thank you!